"The reality is that we’ve gone from an average football team to a good football team to a great football team and we’ve worked really hard to do those things. But we’re not an elite football team yet." I give you my word. We are going to find a way to take the next step. By now, we've all heard James Franklin's words, internalized his promise to make Penn State an "elite" program. But after yet another brutal loss, and yet another fourth-quarter collapse, all we're left with is a general agreement that Penn State's not there yet. Despite back-to-back top ten finishes, a manageable schedule that could lend itself to another one this year, and momentum on the recruiting trail even in a historically bad year for Pennsylvania prospects, we can't help but agree with James Franklin. There's still one more step for this program to take. But that raises a few questions: First, how do we define an elite program? What would an elite Penn State even look like? And how could we possibly get there? Trying to quantify something as nebulous as "elite" is a near-impossible task. Hell, it's become a meme to ask whether something or someone is elite (especially Joe Flacco). And college football is defined by ebbs and flows: Clemson's been the second-best program in the country the past three years, but before 2012 hadn't had a top-10 finish since 1990. Florida was an afterthought for 70 years, hired Steve Spurrier and enjoyed seven-straight top ten seasons, floundered for a bit until Urban Meyer was hired, and hasn't really competed at a national level since. If we're defining "elite" as a team that's a perennial national title contender, what we're saying is that over the past decade, the only two elite programs have been Alabama and Ohio State and more or less nobody else. James Franklin can't really expect Penn State to join the upper tier of the upper tier, so let's try and find a more reasonable target. If nothing else, this should show us just how much things change. Over the past decade, Oregon and Florida State have been, undeniably, two of the best programs in college football. But as we sit here today, would anyone actually want Penn State to trade places with these two teams, both breaking in new coaches, to varying degrees of success? Those two schools have shown us that glory fades - unless you're Alabama or Ohio State, and that even a championship run can't keep a program above water in perpetuity. Other programs show that simply racking up a winning record isn't the key to being considered an elite program. Wisconsin's been a great program since Bret Bielema showed up 12 years ago - but hasn't really sniffed a championship, despite hanging around the top 15 on an annual basis. Boise State gets the mid-major asterisk for beating up on the MWC. And while Stanford has been perennially, and quietly, great for a decade now, somehow they just don't come to mind when you think "elite" (even though they probably are). Think Georgia should be on that list? Just more recency bias. Yes, in just two years, Kirby Smart has put that program in the "elite" conversation, but last year was just the Bulldogs' fourth top-25 finish since 2009. They've finished with 5 or more losses just as many times. USC's only mustered two top-10 finishes since Pete Carroll left, with just one NY6 bowl appearance (we remember how that one ended). What this really shows is that it's Alabama, Ohio State, and then the field. Those two programs are putting up more than 11 wins per season since 2009, with Bama averaging a truly nutterbutters 12.5-1.3 record. Those aren't just elite programs, they're historical dynasties. But hey, Clemson's come on incredibly strong in the past few years. I expected more out of Oklahoma (they haven't polished off a 1-loss season since 2004) but they're perennially in the title hunt and at the top of the Big XII. But anyway: in terms of wins and losses, can Penn State really expect to join this group? Playing in the Big Ten East, against Urban Meyer, Jim Harbaugh, and Mark Dantonio ever year? We're still in a place where a 10-2 season is a qualified success. For these programs, it's become more or less a birthright. For Alabama, Ohio State, and Clemson, that would be an incredible letdown. It's important to note that if we're defining the true "elite," as opposed to "great" programs, as Alabama, Ohio State, Clemson, and Oklahoma, and, sure, Stanford, it means there's only one per conference. Clemson has usurped Florida State in the ACC; Stanford's done the same with Oregon out west; Alabama has fought off runs here and there from Florida and LSU and Auburn to stand head and shoulders above the SEC. With that in mind... is there room for two of the best six or seven programs in the country in the same division? With Michigan breathing down Penn State's necks? It's another wrinkle that few other programs trying to make the next step have to worry about, and it's one that casts a significant shadow on James Franklin's promise to get there. But now that we've narrowed down the field to the truly elite, the question is even simpler: What does Penn State have to do to compete with these five programs? What are they doing to be elite that Penn State isn't? First, how about the value of the programs? How much revenue are they bringing in? How much money do these programs have to spend on becoming or maintaining, their eliteness? That's USA Today's data from 2017-18, and, well, the biggest takeaway may be that money isn't everything. Despite having all of King Midas's silver, Texas A&M and Texas (who top Ohio State by upwards of $25 million each) certainly don't belong at the elite kids table. Nor, for that matter, does #11 Tennessee. Clemson's done a whole lot more with less than any comparable program, but at the end of the day, each of these teams is generating more money than anyone knows what to do with. Could Penn State use an extra $40 million? Sure - there's always improvements to be made in the facilities, perhaps more could go into the recruiting budget, maybe you pull a Harbaugh and take the team on a free trip to Italy. But it can't be a lack of money that's holding Penn State back, except, perhaps, from turning Holuba Hall into a student-athlete Disney World to rival the practice facilities at Alabama, Clemson, and Ohio State - though somehow, I don't see a lazy river coming to University Park anytime soon. Recruiting rankings are 247's composite. And you guys aren't going to believe this, but Alabama and Ohio State are pretty good at recruiting. But after that, it's anyone's game - proving even more that there's "elite," and then there's ELITE. Clemson and Oklahoma have been very strong, but not remotely at the same level as Bama or the Buckeyes. Nobody has been - and the top 10 is littered with "great but not elite" programs, like Notre Dame, Miami, Texas A&M, USC, UCLA, and Auburn. 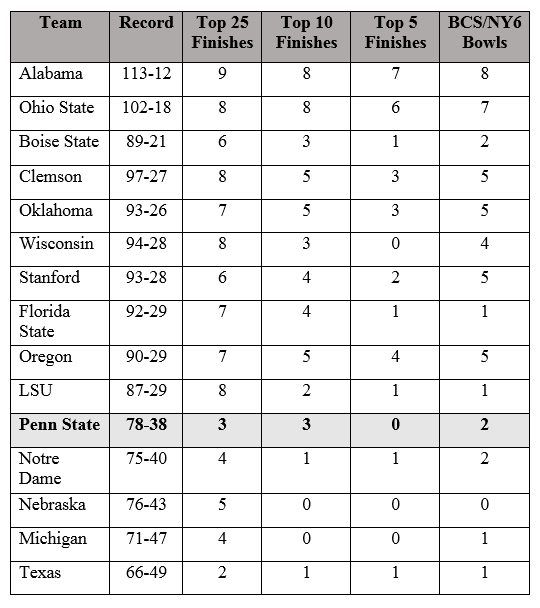 And Penn State's not all that far behind, especially when you factor in the sanctions. In James Franklin's last three classes, the Lions have finished 20th, 15th, and 6th - not only a terrific trajectory, but a record that isn't far off from anyone save those top two programs. Is it reasonable to expect more top 10 classes? Absolutely. Even the current group for 2019 is ranked 12th, not because of a lack of talent, but because of a small class. Penn State's 91.27 recruit average ranks 9th nationally. Keep this up, and Penn State's well on its way. You don't need to win the recruiting rankings as long as you're consistently bringing in upper echelon talent. Finishing somewhere between 7th or 8th and 15th every year is a recipe for sustained success. It also bears keeping in mind that despite "non-elite" recruiting for the first few years of Franklin's tenure, he's still put together a roster that was the better team Saturday night. Penn State outgained Ohio State by 103 yards, held the top scoring offense in the country to 27 points, completely took the downfield passing game away from Dwayne Haskins, forced J.K. Dobbins into a deeply mediocre 3.4 yards per carry, and had the game in the bag before choking it away late. There's a ton of room for improvement on this roster - especially in the trenches, and in the back seven of the defense. But Penn State has been pulling in the talent that gives good reason to believe that this three-year stretch hasn't just been Trace McSorley elevating an 8-4 roster, that the reinforcements can keep this program moving in the right direction. But is it reasonable for Penn State to join the ranks of Alabama and Ohio State in pulling in a top-5 class (if not #1, for Bama) year-in, year-out, and creating a roster, like those, where 5-stars are backing up other 5-stars? A roster where rebuilding isn't even a consideration, where talent can buoy inexperience to a conference championship? Almost certainly not, and for a great many reasons - stricter admissions requirements, less booster cash to hand out, less fertile recruiting grounds. 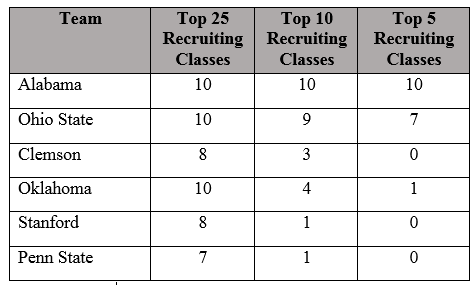 Penn State's made inroads to becoming a national recruiting powerhouse (and has done more work in the southeast and west coasts recently than we've ever seen), but Alabama and Ohio State are already there. It's hard to see James Franklin having an Ole Miss-like ascension up the recruiting rankings (especially, as we've learned, how much of that was thanks to illicit payments). But again - Penn State can bring in comparable classes to Clemson and Oklahoma without making that quantum leap. So if Penn State isn't going to be bringing in much more talent, how about developing it? Is there room for improvement in terms of assistant coaches? 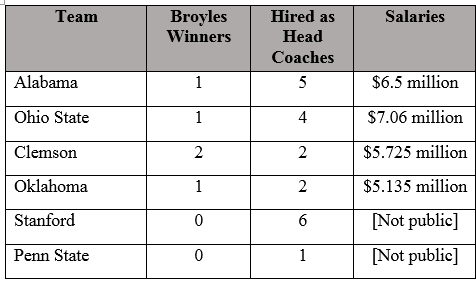 Setting aside how hard it is to measure assistants, we can look at a few metrics: how many have been Broyles Award nominees? How many have been hired to coach other programs? And how much are programs spending on their staffs? (Ohio State's really 5, given the Schiano situation at Tennessee, but that's a quibble). When it comes to assistants, Alabama has taken in former head coaches left and right, and turned its coordinators into head coaching candidates on a yearly basis. So too has Stanford - Jim Harbaugh's coaching staff in 2009 included, among others, David Shaw, Willie Taggart, Derek Mason, and D.J. Durkin. (They went 8-5. Go figure.) Meanwhile, Clemson's had Brent Venables since 2012, and Mike Stoops has been at Oklahoma just as long. Before Joe Moorhead, schools didn't go shopping for head coaches at Penn State - though Brent Pry had been reported as a target for UL-Lafayette last offseason. I concede that the numbers may be off - I used Wikipedia's "Coaching tree" section and who knows when those were last updated. First, you can see how much Franklin values loyalty: both of his coordinators, as well as his most prominent position coach, Sean Spencer, have been with Franklin since he started his head coaching career back in 2011. But loyalty has its faults: it took Franklin five years to get rid of the plainly atrocious John Donovan (though he made an impeccable hire in replacing him with Fordham HC Joe Moorhead). And some of the lateral hires have been facially unimpressive: when Alabama poached JoshGattis, Franklin did a good job landing Seider from Florida - but it's hard to call that a poach, with Jim McElwain getting fired and Dan Mullen bringing in a new staff from Mississippi State. The rest of the hires were clear steps up - promotions from smaller, less powerful programs; young coaches, but none particularly flashy or exciting. And that's the rub. Ohio State has two former successful college head coaches on its staff, a former NFL coordinator, and an NFL QB coach that was very nearly hired as offensive coordinator for the Tennessee Titans. (OSU spent the money to keep him.) When it's needed to fill a position, it's poaching elite assistants from Notre Dame and Penn State as often as its offering a lateral move to those from lesser programs. And that's after losing Mike Vrabel, Luke Fickell, and Tom Herman to head coaching jobs in the past few years. Ohio State is a coaching powerhouse. How about Bama, you ask? Lot of new hires in Bama. Which makes sense, considering that in the past three years, the following coaches have been plucked out of Tuscaloosa to lead their own program (takes deep breath): Billy Napier, Jeremy Pruitt, Mario Cristobal, Kirby Smart, and Lane Kiffin. And in replacing them, Nick Saban has convinced coaches to take demotions, or paid them more to make lateral moves from storied, moneyed programs. That's living right. When Oklahoma needs an assistant, it goes to the best programs in the country to find talent. Sure, it took a guy from Kansas, but its hires are lateral moves from Georgia, Auburn, West Virginia, and Notre Dame. For WRs, it went to Mike Leach's Wazzu (not triple-option Army, like James Franklin). Oklahoma, like Alabama and Ohio State, is putting elite talent in the hands of elite coaches to achieve elite results. How does Penn State join them? It's not a trick question. That really brings us to the tl;dr of it. To be elite, James Franklin needs an elite coaching staff. We have the money. We have the 'croots - especially moving forward. We'll never be Alabama or Ohio State, but what's holding Penn State back isn't complacency. It's coaching. There are a couple of high-profile poachings, but Dabo Swinney has succeeded by identifying coaching talent at small schools, or even high schools, and bringing them to Clemson. If the James Franklin model can succeed, it'll have to look a lot like Clemson. That said, there's no upside to losing established coaches to bigger programs, and Penn State simply can't be in the position to see guys like Shoop, Gattis, or even Larry Johnson move on for lateral jobs. Especially if James Franklin is shopping in the discount bin to replace them.